Why expect a highly successful individual to pay attention to an unknown biologist living in the middle of nowhere? Only because there is a dire need to get a vital message out to the masses, one that gets the average person to never see themselves - or their place in the environment - the same way ever again. As I see it, the human race is on a fast track to a very calamtous future; and since none of us is as smart as all of us, it's going to take a team effort to pull this paradigm-shifting effort off. You'll see that the theme of the movie I'm pitching has much, if not EVERYTHING, to do with psychology; that will be driven home in the many unsuccessful letters I've written - or videos I've made - over the past five or more years in my solicitations for help. You can look forward to reading letters or E-mails to such noted authors as Sara Gruen (Water for Elephants), John McPhee (Rising From The Plains & Founding Fish, among many others), Carl Hiaasen (Double Whammy, Bad Moneky, Skinny Dip, Striptease & others), David James Duncan (The River Why, My Story As Told By Water)...some of who I actually heard back from, and you'll see their responses. This movie that I envision will not be lacking in humor (a big reason I wrote to Carl Hiaasen), and several of my futile attempts to find help have been dowright comical! I may be a dreamer, but I see my quest to find help not much different than Colonel Sanders' attempt to find someone to give his "finger lickin' chicken" a try - it supposedly was the 1,008th person he contacted that finally gave it a go...and the rest is history. I haven't been rebuffed that many times, but with each one I'm getting closer. I know one thing, I'll never give up trying to make a difference on the environmental front - the stakes are too high and the potential consequences beyond frightening. WHY PSYCHOLOGY - because Homo sapiens (i.e., "the wise ones") must get in charge of ourselves psychologically - i.e., individually & collectively - in order to avert widespread ecological and social calamity. So how was a guy like me going to get in touch with someone as famous as Michael Lewis? I took a chance and wrote the following E-mail to Paul Slovic, a psychologist who was featured in The Undoing Project, a book that has a lot to do with psychology and many of the human foibles that keep "the wise ones" from finding solutions to the myriad sticky wickets facing mankind. 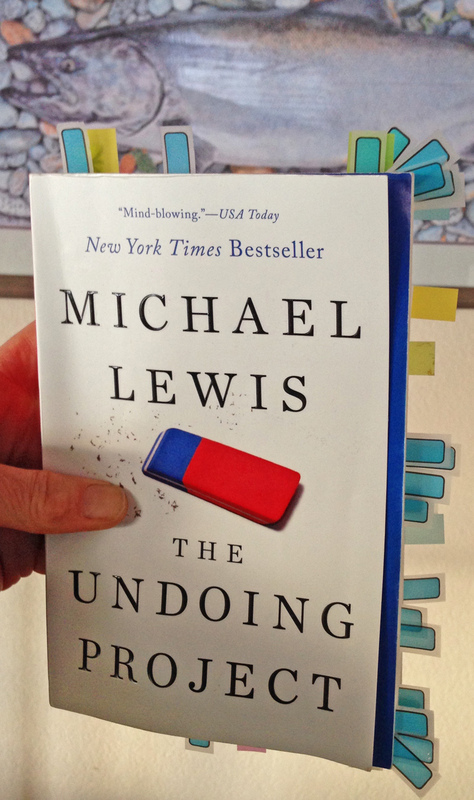 I recently read The Undoing Project by Michael Lewis and am asking for a long shot. I’m guessing that you occasionally keep in touch with him, or at least have his contact information since you were a big part of his book. Could I be so bold as to ask you to pass this E-mail and attachment on to him? Thank you in advance. I’m a fish biologist who thinks a lot about psychology and the implications it has on our many environmental quandaries. I didn’t become a biologist until late in life – i.e., my late 30’s when I graduated with an undergraduate degree from the University of Wyoming. I was quite naïve and wanted to “save the fishes”, which I’m passionate about. Several years later I found myself in central Idaho working for the Forest Service doing “combat biology” because the Chinook salmon had recently been listed as threatened under the Endangered Species Act. What a rude awakening that was! Sadly, the dwindling Chinook would soon be accompanied by steelhead and bull trout; eventually Chinook were upgraded to endangered status…all of which made the spotted owl issue look like a walk in the park! I don’t know if you’re familiar with Robert Lackey from Oregon State, but he wrote a provocative article titled Defending Reality that had a huge impact on me (I’ve attached it here in case you’re interested). Between Bob’s article and my contentious experiences with loggers, gold miners, ranchers, fishermen, and fellow Forest Service employees – I realized that not only could I not save the salmon of the Pacific Northwest, but maybe no one could…at least not using the same old approaches. That’s when I started to focus on the psychological underpinnings that lead to our ubiquitous environmental conundrums. To me, most things are merely a matter of scale. The personal biases and mentalities that I saw at work against the fishes are the same ones that keep Homo sapiens from solving larger issues like climate change. I contend that the human race, on several fronts, is flirting with calamity like never before if we don’t collectively get in charge of ourselves psychologically – and that’s the theme of the movie I’m pushing. As noted previously, I’m hoping to somehow get in touch with Mr. Lewis because I’m looking for help with a movie treatment and he likely has contacts with highly talented screenwriters, etc. Please believe me, I’m not in this for fame or fortune; my efforts are for the resources that can’t speak for themselves and future generations that will probably find themselves asking, “How did those past generations get us in the pickle we’re in?”. They might phrase it a little differently, however. I’m a fish biologist, and like Mr. Morey bringing a different approach to decision making regarding managing a professional basketball team, I have a unique approach - or plan - to getting a vital environmental/ecological message out that involves a full-length feature film that revolves around psychology and the many human foibles most of us exhibit. The more I read books like yours and reflect back on my personal experiences, the more they reinforce my vision for a movie highlighting human dysfunction and the need for the human race to get in charge of itself psychologically; i.e., individually and collectively. Over 60 years ago, Aldo Leopold, an early ecologist and true visionary, expressed his frustration over, “the futility of trying to improve the face of the land without improving ourselves.” The way I see it, WE MUST COME TO OUR SENSES in order to avert widespread ecological and social disruption. Like Mr. Morey not being able to penetrate organized sports, I’ve spent the past five or more years trying to penetrate the film industry with virtually no luck…except one year ago I was asked by a wildlife filmmaker to produce a movie treatment; and that, I have found, is no easy task. Here’s the gist of the film: Much like the unlikelihood of a psychologist getting a Nobel Prize in economics, an unknown and unassuming fish biologist living in remote Alaska is trying to bring psychology and humor into the mix in a way that just might get the average person to never see themselves, or their place in the environment, the same way ever again. Unfortunately, when biologists are wrong the implications can be far worse than an NBA team choosing the wrong player in the draft. Being a fish biologist has given me some unique insights into human nature. One thing I’m certain of, because of the unremitting pressures on the environment and the rapid decline of biological diversity – “the wise ones” will pay the ultimate price. Regarding the impending climate change conundrum, the biggest obstacle scientists face in convincing the public and politicians to act now is the pervasive “present bias”. Not to beat around the bush, I need help crafting that movie treatment I’ve been asked to provide. I know I don’t have the talent to do this endeavor justice, mostly because of the complexities involved. As I see it, the structure would flow much like a Robert Altman film (Altman was a renegade in the film industry - he avoided conventional storytelling and opted for showing “the busy confusion of real life”). It’s going to take some creative minds to bring this project to fruition. Do you think that Mr. Chervin, Mr. Sorkin, or Mr. Zaillian would be interested in hearing more about this? I’m hoping to find a partnership with a writer similar to that of Daniel Kahneman and Amos Tversky where that person can weave my complex and seemingly disjointed ideas into a solid storyline…one that Robert Altman, if he were alive, would consider taking on as a project. Regarding two topics in The Undoing Project, i.e., imagination and uncertainty - my imagination runs wild with endless possibilities. Although this story would be loosely based on my life and my concern for the environment, it will take a critical and sometimes irreverent look at Homo sapiens and our many foibles that we must overcome to avert widespread ecological calamity. The take-home message or theme is that somehow, we must get in charge of ourselves psychologically. Maybe you can have a part in getting the masses to rethink their actions and their place in the environment! This may sound pretty impetuous, but I’m confident that if you were to write a book about psychology and the environment - with some input from me - that it would be the most pleasurable project you’ve ever undertaken (I’ve got a plethora of comical anecdotes depicting the human dysfunction you, Messrs. Kahneman & Tversky, Mr. Bazerman, and Mr. Peck have written about). You could also come visit me here in “bush” Alaska and hear those stories in person! In making such brash statements, people, who unfortunately don’t know me, have misjudged me and my motives and simply discounted my ideas. I’m not in this for fame or fortune…but for the critters that have no voice and for future human generations. I’ll leave you with this quote that is germane to the following excerpt in your book, “A part of good science is to see what everyone else can see but think what no one else has ever said.” My brother once told me, “No one thinks like you do…no one!” For better or for worse, I often see what others don’t, and, more often than not, think differently than most of my peers.